Mediterranean District, and Vicenza Middle School PTSA. 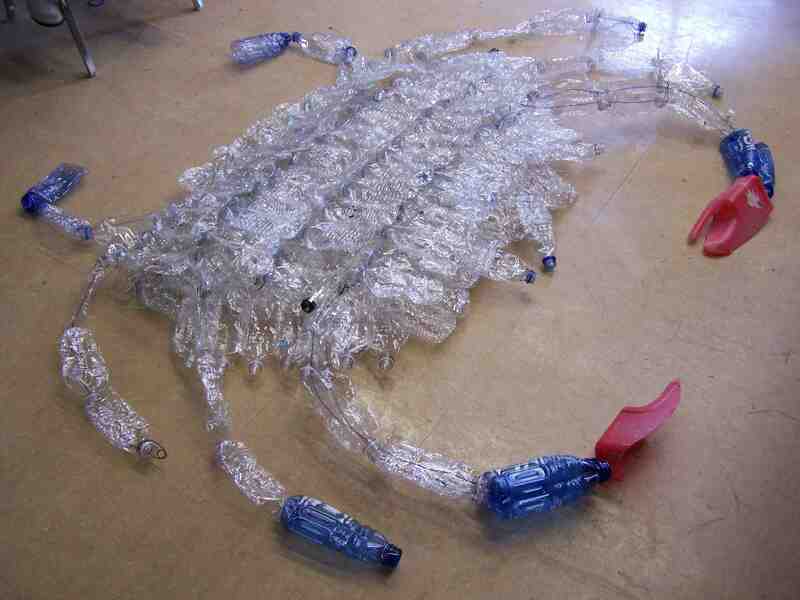 Working with my prototype design, dimensional design students, staff and volunteers collaborated with me to construct three assemblage works resembling massive jellyfish, made by recycling nearly 1,000 plastic water bottles collected by the school community. These permanent installation works influenced by qualities of Venetian and Murano glass, are a response to Venice area water quality issues, and global waterways. Contracted through Dutchess County, NY BOCES Arts in Education. 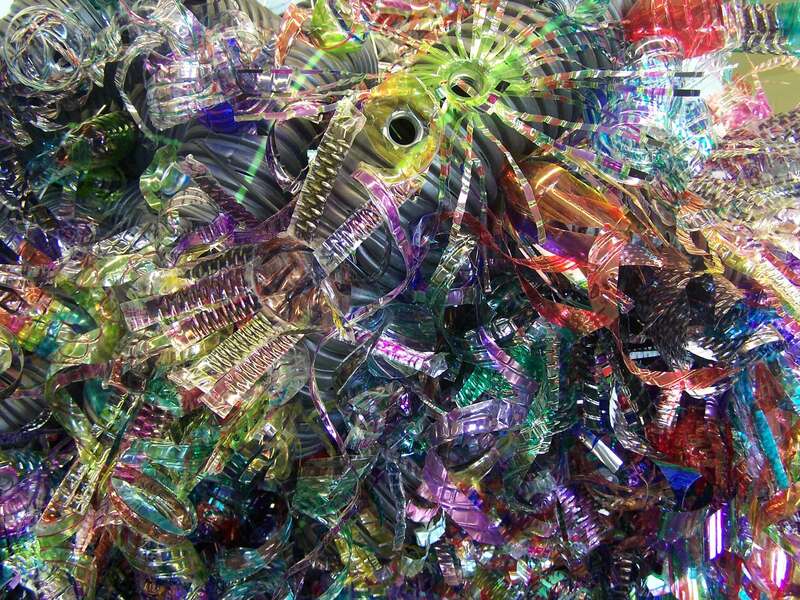 Free-form assemblage made with hundreds of plastic beverage containers collected by the school community, constructed for installation in a building stairwell. 8th grade Advanced Placement Art Students collaborated with me to reconfigure over 600 plastic beverage containers that we subsequently assembled together into a luminous cloud-like structure, with the support of art staff. 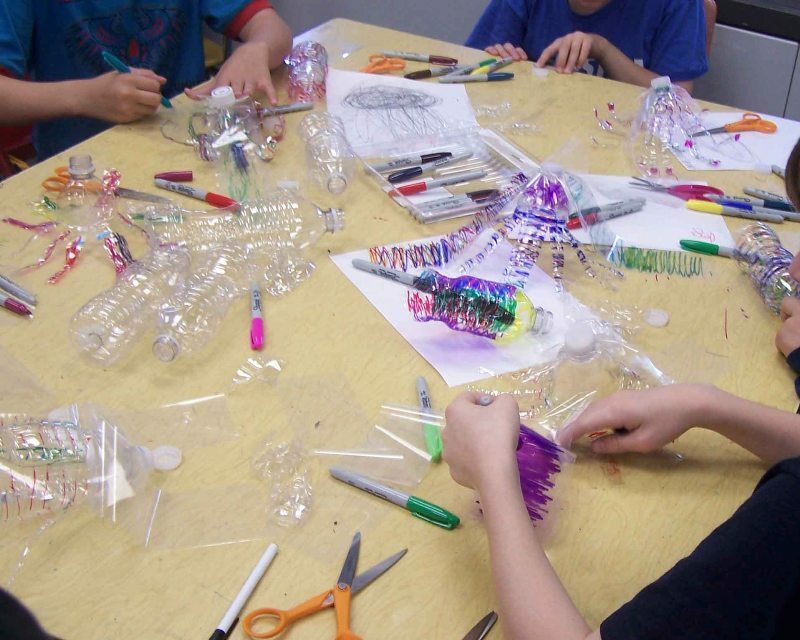 Through a 2011 grant from Arts Westchester, with funds from the Local Capacity Building Program of the New York State Council on the Arts, thirty special, highly responsive students and their dedicated staff crushed, slashed and scribbled hundreds of water bottles. 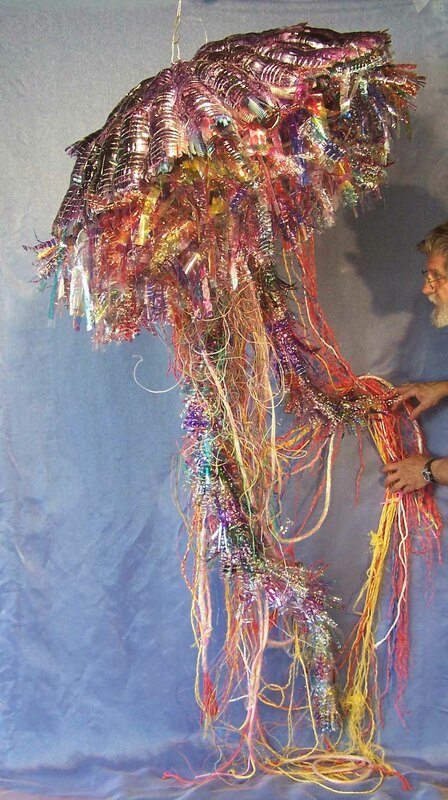 Using this prepared material, they then assisted in constructing an elaborate assemblage, based on the forms of jellyfish. I am grateful to the participants from Montessori 31, and the granting organizations for this uplifting, shared experience. 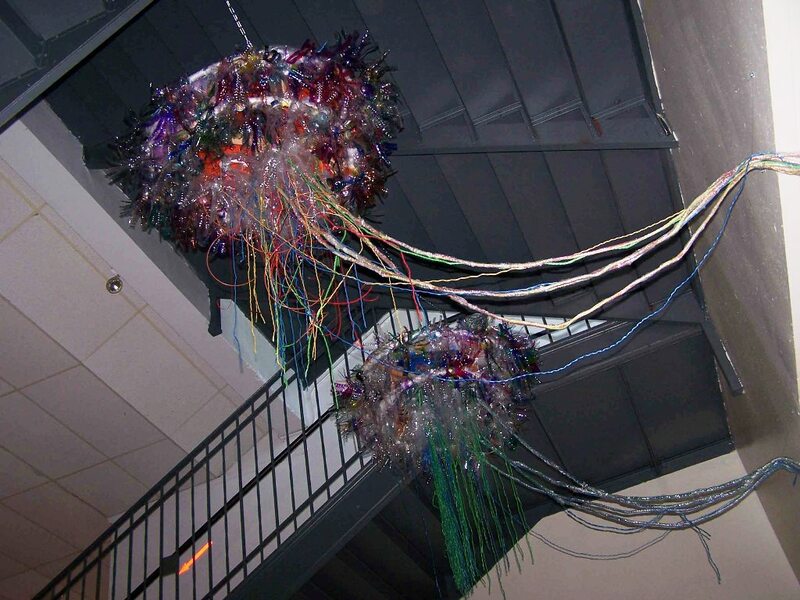 Installed in the school staircase and boasting eighteen foot tentacles, four giant “Jellottle-Bottelyfish”, underscore our need to transform our waste creatively, and to do what we personally can through recycling. 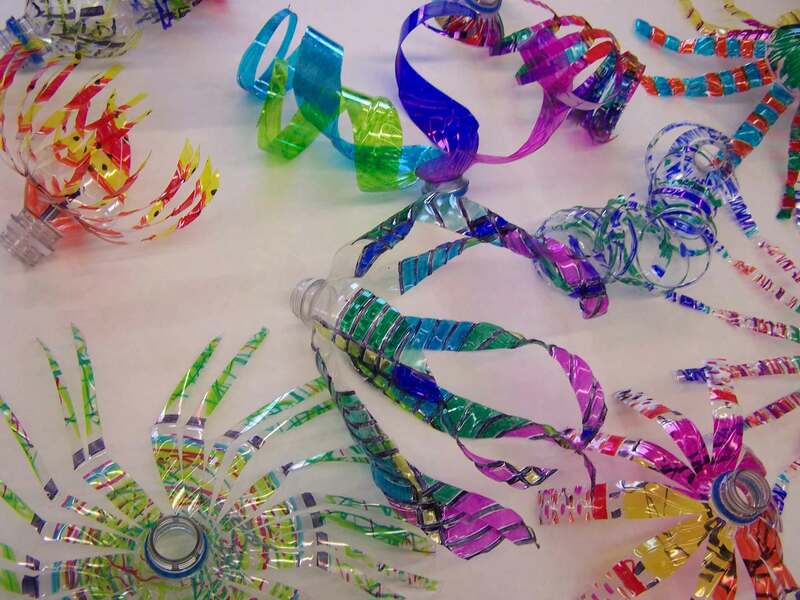 In preparation for my artist residency, 200 6th graders collected thousands of water bottles. I developed an advance prototype later influenced by student sketches and teacher collaboration. Through my presentations, students learned about the impact on our natural resources caused by pollution, global warming and over-fishing of predators. 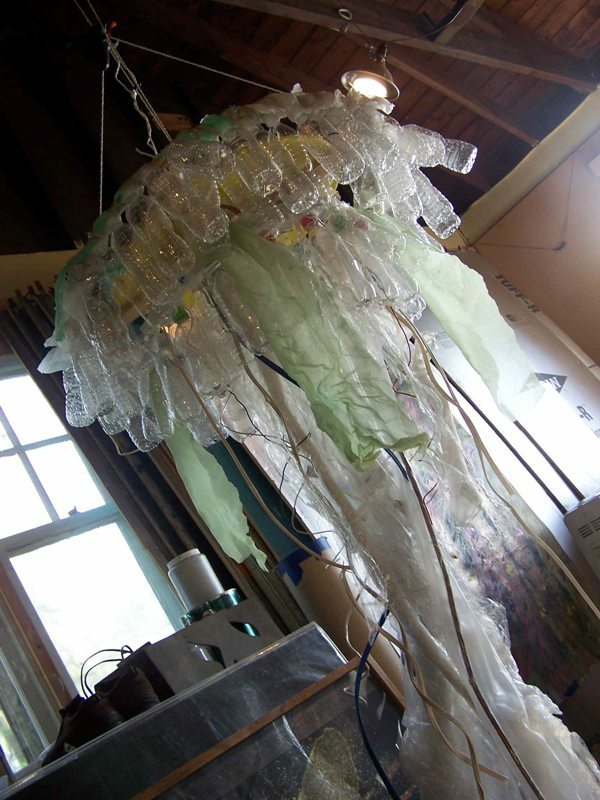 Based on my advance model and using the collected bottles and other materials presenting environmental concern, I supervised four teams of students in constructing the four giant jellyfish assemblage works. The resulting visual spectacle reflects the creative energy and an exceptional collaboration with students and highly supportive staff. It was a great joy for me to have the opportunity to work with the Mineola Middle School. My artist residency was supported through arrangement with Supervisor of Fine Arts for the Mineola Union Free School District, and contracted through Nassau County New York, BOCES Arts in Education division. 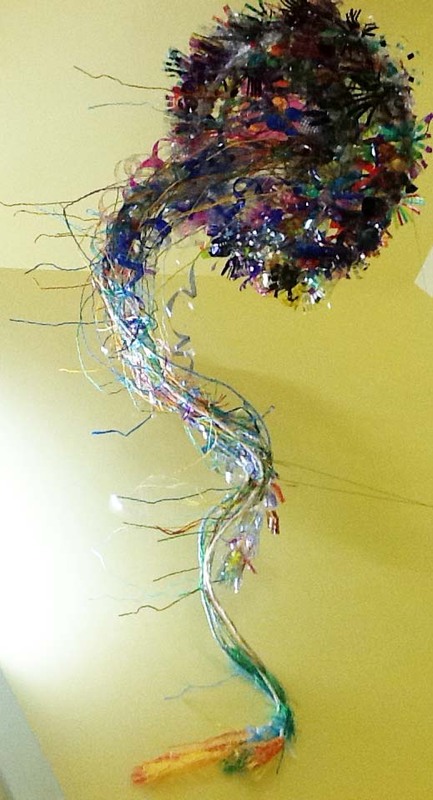 This ten foot wide blue crab form was constructed with students and art staff at Nelson Mandela HS in Mount Vernon, NY, primarily out of crushed drink and detergent bottles, with wire and hot glue. 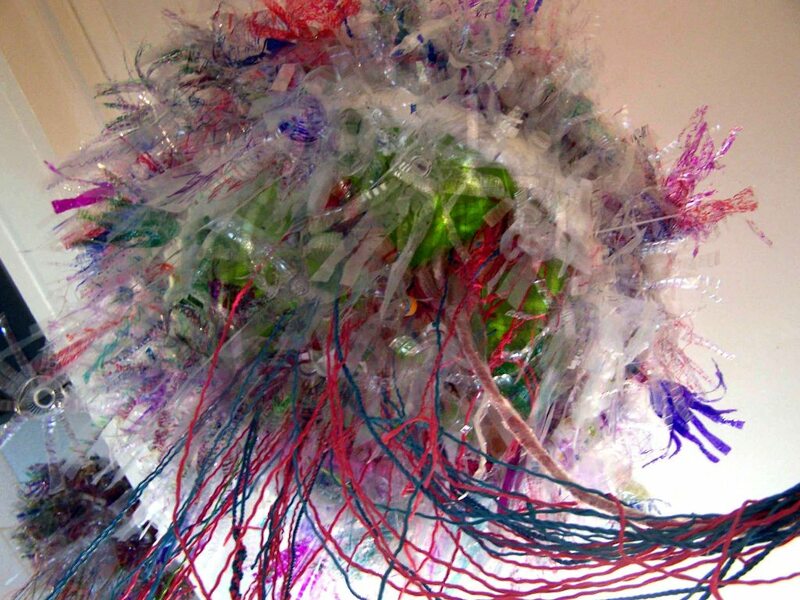 The idea was to use throw away plastic containers to construct an organism indigenous to the Hudson River, as a way of bringing a greater focus on the impact of refuse on our local environment. The project coordinated with 2009 as the 400 year anniversary of Henry Hudson sailing into the river named after him. 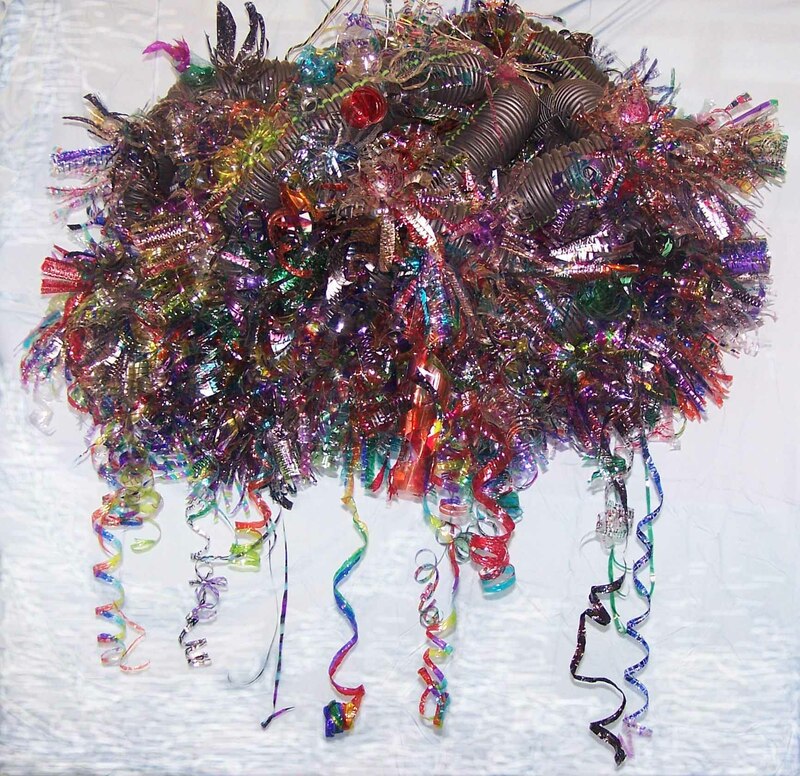 This, and a twenty-five foot ‘MUD PUPPY’ assemblage construction also made from recyclables, were made possible through Federal grant awards for INNOVATIVE ALTERNATIVE STRATEGIES FOR EDUCATORS OF VISUAL ARTS, and administered by Arts Westchester. 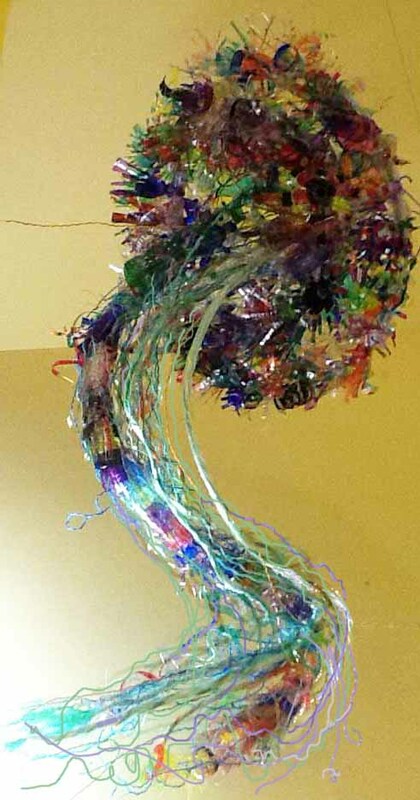 Thank you USA, to those who contributed recyclables, Nelson Mandela students, art staff and to Arts Westchester. Jeffrey worked with 5th Grade students at Crompond Elementary School, Yorktown NY, to develop concept and sketches that resulted in a permanent sculpture to celebrate the school’s 50th anniversary. 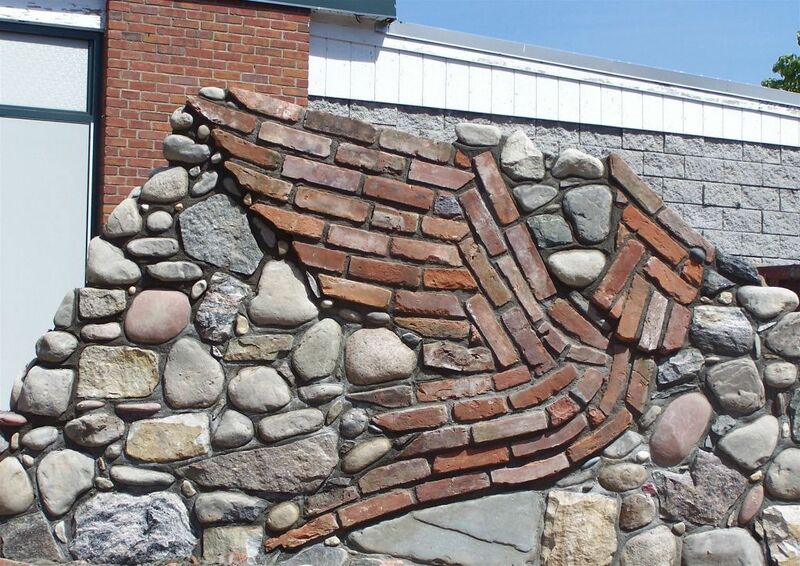 The masonry sculpture, made of brick and stone, represents the school mascot (a Cardinal) and motto (“Home for Mind and the Heart”). Working with brick and stone provided a historical connection to area brick factories that once operated along the Hudson River. Students also contributed stones that they found in their yards or open space. The Westchester Arts Council provided a 2008 Arts Partners Challenge Grant, made possible with funds from the Local Capacity Building Program of the New York State Council on the Arts. Substantial support was also provided by Alfredo Santucci & Sons; Home Mason Supply, Peekskill, NY; Rok-Built Construction; BOCES Arts in Education Program; the PTA and parents from Crompond Elementary School; and the Yorktown Board of Education. 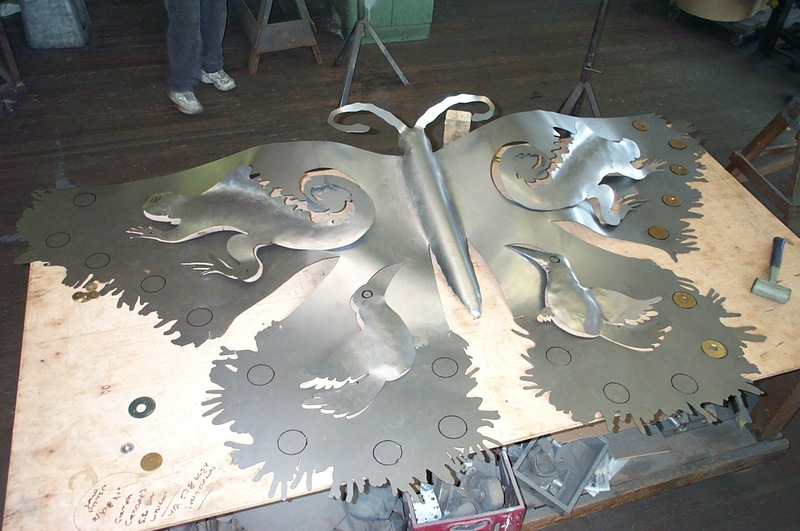 The images below show the first of a new series of steel sculptures shaped as massive butterflies. They are intended to promote community building through the arts. The work shown was supported through grants from the Westchester NY Arts Council; The New York State Council on the Arts; The Pelham Education Foundation; BOCES Arts In Education and the PTA, as it involved the direct participation of 61 students from the Hutchinson School in Pelham,NY. Discussions about how we (humanity) have used our hands to create and destroy, led to projects of visual art where students were guided to use their hands as a point of departure. Participants made tracings of their own hands in distinctive positions, which were arranged into wing shapes that created the perimeter of a massive butterfly. A master drawing of the butterfly shape was laser cut out of sheet steel. It subsequently was given shape through bending and hand hammering at a steel fabricator. The result is a 5’ X10’ steel butterfly, the outer shape composed of 61 images of the different hands of the participant community. The steel butterfly was spray painted at an auto body shop in the community. The hand shapes along the perimeter of the wings were painted by the students. The work has been permanently installed at the school by parent and staff helpers. This particular sculpture coordinated with curriculum involved with study of the rain forest. Shapes of rain forest animals were cut out from the butterfly’s wings then slightly repositioned, providing added depth. Future steel butterflies created will involve similar participation for institutions or organizations that bring the project to their community. This is an excellent arts project to bring diverse participants or communities together for common life sustaining / community building goals. Age range: 4th grade through adults. It requires that sponsoring institutions have a site available for the mounting and permanent display of the finished work. Project participants also learned about the power of community art through the on going WINGS OF WITNESS project, in which to date, nearly 45,000 youth from 23 States and Canada have participated in building a 4 ton memorial in the shape of a butterfly, composed from 11 million soda can tabs collected from all 50 states and eight countries.